Probably the answer to this question is "business as usual", but I've observed of late that the market for bicycles is pretty weird. You can buy a brand new factory-produced bicycle in the US (I'm really only talking about the US here) for anywhere from \$50 (when not on sale) to maybe \$10,000 (depending on where you want to draw the line between "production" and "custom" bikes). Some of this difference is due to actual quantifiable value -- the more expensive bikes generally are lighter, handle better, have advanced features, and are marginally more durable (though the cheap bikes are remarkably durable). However, much of the difference is clearly "glitz" -- the latest features, fancy (though oddly impractical) arrangements of spokes in the wheels, etc. More to my point, however, is what happens to the value of a bike once you "drive it off the lot". A "moderately priced" bike (say \$500-1000) will lose (very rough figures -- I've not done any rigorous research) maybe 50% of its value each year, such that it's market value (if in perfect condition) is less than \$50 after 5 years. The net result is that lower-end bikes are not deemed worth selling when unused, and they tend to accumulate (even worse than other possessions) in basements, garages, and backyard sheds. I became involved in this "market" because I work with a small group which reconditions used bikes and distributes them to various charities (primarily Christmas Anonymous). Our small group, consisting of about 8 active members working two afternoons a week 8 months out of the year, manages to rehabilitate 200-300 bikes a year. But we get donations of at least twice that amount, with the surplus being sold for scrap. Currently we have so many bikes that many must be stored outside, and it is somewhat disheartening to see, say, a very nice looking bike in good condition, which sold originally for maybe $800, standing in a field of weeds, rusting away. So I get to thinking that there must be some economic principle at work here, beyond simple supply-and-demand, to cause such a skewed market. Why can something of such inherent value (and so highly valued by the purchaser when new) become valueless so rapidly? But I admit that not only do I not have a clue what it might be, but I find myself failing to even describe my perplexity adequately. What principles are at work here? Is there anything "interesting" or instructive in the scenario? Interesting observation. Perhaps a part of the answer lies in Akerlof's lemons' problem? Admittedly judging the quality of a 2nd hand bike is easier than that of a car, but from what you're describing in the US there doesn't seem to be a well functioning market for 2nd hand bikes in the US. Moreover, bikes are becoming more and more like cars in that respect with all the gadgets and technology that one cannot fix in their own shed or backyard. Perhaps it also plays a role that US citizens are not used to bikes and therefore have a harder time judging their quality (just guessing here, and perhaps stereotyping too much). Here in the Netherlands we seem to have a well-functioning market for them that serve all segments (including, I might add, a high theft rate), but everyone rides a bike here, so we should be better at judging their quality. This is a really engaging question. Not only does it identify an observable pattern (regarding the "depth" or lack-thereof of the second-hand market of bicycles) it also associates that pattern with 'value' (in-use and intrinsic). "...what happens to the value of a bike once you "drive it off the lot (...) Why can something of such inherent value (and so highly valued by the purchaser when new) become valueless so rapidly?" Although asymmetric information (see answer by @Maarten Punt) is definitely in play (the seller knows more about the condition of the bike than the potential buyer) I don't think that the second hand market for bicycles is as shallow as described in the question for reasons predominantly related to quality. Buying a second-hand bike is not as complicated as buying a second-hand car. The potential buyer can readily identify quality characteristics or pinpoint possible mechanical or design failures. The 'lemons' in the bicycle second-hand market are probably less sour than are their mechanical cousins, the automobiles. With these observations in mind, we'll take a different route in figuring out what's going on. The flow of services that a bicycle delivers can be quantified in a roundabout way. Namely, we can-in a sense-use an envelope of services that are substitutes for bicycle services to encapsulate the value of owning a bicycle. In the Appendix of this note we have identified three activities that are used as proxies for the value of a bicycle, namely 'transportation', 'exercise' and 'leisure activities'. The flow of services an average bicycle delivers over the period of one year is calculated to be equal to \$1,834.6. Then, after having decided what the value therein is, we can subtract its price and then obtain a measure of the residual value that the consumer is left with, after assuming the costs needed to obtain a bicycle. A 'used' bicycle, is a bicycle that has been purchased relatively recently and is resold by its owner in the secondary market. As far as its quality characteristics are concerned, they are close enough to the respective characteristics of a brand new bicycle of the same make. 'Refurbished' bicycles, are used bicycles that have undergone a-more or less extensive-repair and revamp process. Finally, 'scrapped' bicycles are bicycles that are either sold for parts or recycled altogether. In the Appendix of this note we have obtained a measure of the value of 'refurbished' and 'scrapped' bicycles. They are valued at \$160.278 and \$11.25 respectively. Buying a new bicycle can be treated as an investment. By incurring the costs of the investment (the retail price of the bicycle) the user is entitled to 'harvest' the remaining (or residual) value by virtue of ownership rights. Now, the residual value (= \$1,834.6 - price) is subject to depreciation. Buying a bicycle and locking it up in a closet will not retain its residual value intact. Value, dissipates. The rate at which this happens is different for different makes of bicycles. Also, different riders, have different subjective valuations regarding the speed of that process. What does that mean for an eg. \$600 bicycle? The following graph shows the different value regions that are relevant to pricing the \$600 bicycle in the second-hand market. The rate at which value dissipates is denoted by $\delta$. Given the price of the bicycle set at \$600, different values of $\delta$ imply different time scales for value dissipation. 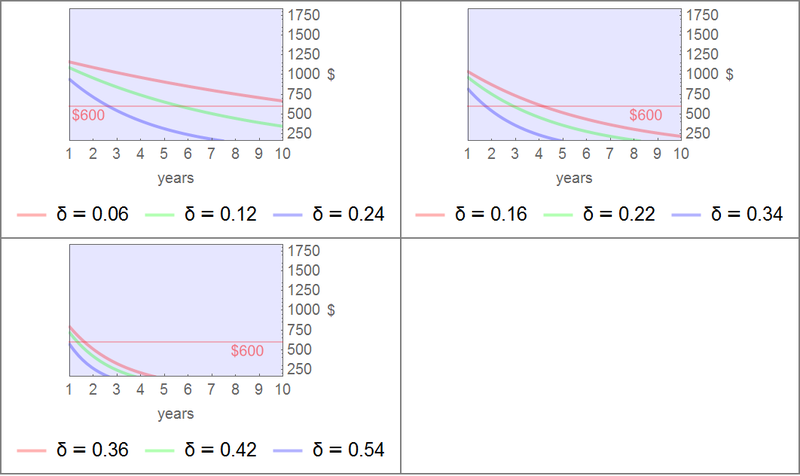 The following three graphs show what happens to the residual value of a \$600 bike under different values of $\delta$. First, as $\delta$ increases, the residual value after one year drops (notice the y-intercept at $n=1$). This is true for all the graphs. For moderate values of $\delta$, this point is above the price level. Lastly, the number of years it takes for the residual value to fall below the price and become equal to the refurbished value (the x-intercept), falls as $\delta$ increases. This is clearly seen in the third graph. What is relevant for the task at hand, is the fact that high rates of depreciation of residual value (high $\delta$'s) imply that the commodity becomes old (obsolete) faster and 'force' it to approach the boundaries of the refurbished market rapidly. This implies that the time it spends in the territory of the 'used' segment is really short or virtually non-existent (notice how on the third graph for $\delta=0.54$, the bicycle, after two years of use-or storage, for that matter-has a residual value that is approx. equal to the refurbished price). Therefore, what happens to used bicycles is heavily dependent upon the relevant value of $\delta$. It seems that relatively high values for the residual value depreciation parameter will scrap the value of a moderately priced bicycle real fast to the point where it becomes worth-less relatively fast. The real question is what sets the particular value of $\delta$ at relatively high levels, in the first place. For small distances (less than 10-20 miles) perhaps it would make more sense to use a bicycle than go on foot or-worse even-use the car. Obviously, substituting cycling for driving (or walking) depends on a host of parameters (like availability of bicycle lanes, average road congestion, cultural attitudes towards cycling, availability of other transit alternatives for small distances, crime rates related to petty theft etc) and relative prices. The price of a gallon of gas seems to be equal to $2.152 (approx.). Assuming the relevant distance covered by an individual using a gas powered vehicle (small car or other motorized two-wheeler) is 20 miles a day and that in a year this use case of the vehicle is applied two thirds of the time (ie 240 days approx.-because you don't go every day eg to the grocery store) then with an average figure of miles per gallon around 60, operating a vehicle for small distances over a year costs \$172.2 (= 240 days 20 miles/day / 60 miles/gallon $2.152/gallon). Average annual exercise costs can be as high as \$696. As far as leisure time is concerned, people tend to do different things that suit their personalities, tastes and social backgrounds. According to this time use survey by the BLS, 0.3 of an hour per day is spent in 'Participating in sports, exercise and recreation' activities while 0.415 of an hour is spent in 'Other leisure and sports activities, including travel' (average for both sexes). It seems that the later activity takes 38% more time than the former (0.3 hour 60 min /hour = 18 min and 0.415 hour 60 min / hour = ~25 min). We are going to assume that the costs associated to 'Other leisure and sports activities, including travel' are, also, 38% greater than the costs associated with 'Participating in sports, exercise and recreation', namely they equal \$966.7 (approx.) on an annual basis. Adding up the annual costs of transportation, exercise and recreation sum up to a value of \$1,834.6. This will be assumed to be the equivalent value of owning a bicycle in the US as of late 2016-2017. Opportunity costs for refurbished bicycles. Obviously, not all bicycles are made from the same materials. For the sake of simplicity, we'll assume that bicycles that are relevant for the second hand market are predominantly made of steel or aluminum. 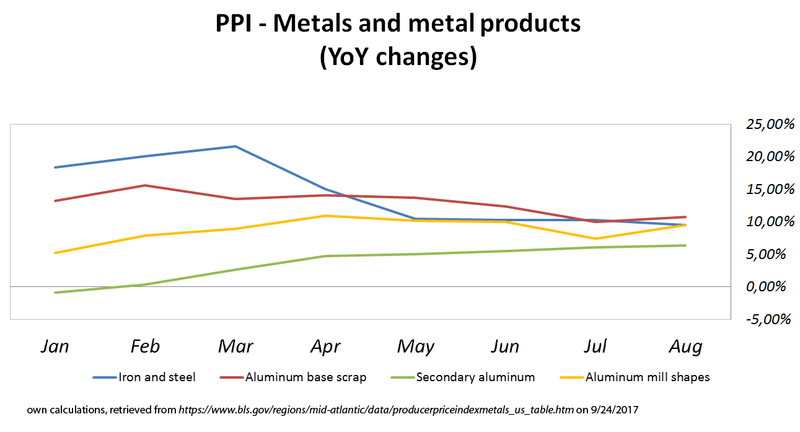 Namely, both steel and aluminum (producer) prices seem to be "moving in tandem" (approx. 13%-14% yoy on average). When two commodities (raw materials) are displaying similar price movements, there is no reason to expect that either will be relatively more preferred than the other in all relevant applications. We'll choose to interpret this finding as a sign for treating steel and aluminum bikes as equally probable. The price of scrap metal (from here, here and here) seems to be approximately \$0.5/lb for aluminum and \$0.4/lb for steel (depending on the grade). It would seem that a bicycle weighs, on average, around 25lbs (20lbs for road bikes and approx. 30lbs for mountain bikes). Although this weight figure includes the weights from all the parts of the bicycle-not just the frame-we'll nevertheless chose this as the operational weight figure. With all this information in hand, we can calculate a rough estimate of the scrap value of the bicycles that the OP mentions. Namely, 250 bicycles (per year, on average) have a scrap value equal to \$2,812.5 (=125 \$0.4/lb 25lbs+125 \$0.5/lb 25lbs). On average, a single bicycle has a scrap value of \$11.25 (=\$2,812.5 / 250). The minimum wage in the US is on average equal to \$7.55/h. Having 8 persons working for 3-5 hours a day for 2 days a week for 8 months a year amounts approx. to an annual value equal to \$14,850. From here we get that changing the tires and inner tubs of a bicycle, changing the saddle and break pads and replacing a wheel costs approx. \$80. Treating in the same way 250 bikes amounts to costs for parts of \$20,000. We figure that since the \$80 price tag is a retail price, we'd be eligible for a wholesale price discount say for 40% of the retail value. Thus we calculate that costs for parts would amount to \$12,000 per year. So far we've calculated labor costs and materials' costs and haven't included figures for tools and facilities costs or utility expenses etc. We are abstracting from those costs and we assume that financing will need to cover one year of operating expenses, namely \$34,850 (= \$14,850 + \$20,000). The interest rate charged will be LIBOR +/- 2.25% spread. Also, we assume that the loan will have to be repaid in 7 years. With a base rate of 1.7676 (we ignore the spread) the annual financing costs are equal to \$9,601.4. So, what's the imputed price of a refurbished bike? Combining the scrap value of the frames and the costs associated with the process of restoring bicycles to operating condition, should provide a lower bound for the value of a refurbished bicycle. It is a 'lower' bound because there are certainly other costs and overheads we didn't include in our calculations and also because our calculations are rough and not precise. With that in mind, \$160.278 seems to be the (opportunity) cost of a refurbished bicycle (assuming a 3% profit margin on labor and materials' cost). Not the answer you're looking for? Browse other questions tagged microeconomics reference-request or ask your own question. Articles about police complaints for a lit review? Causes of upward trend in median first marriage age in USA?